The Jwaneng Diamond Mine, located in southern Botswana, is the world’s richest diamond mine. Botswanahas set aside 17% of their land as nature reserves – much more than the recommended 10%. Most Botswanadiamonds are mined by the Desbwana company – 50% owned by DeBeers and 50% owned by the government of Botswana. 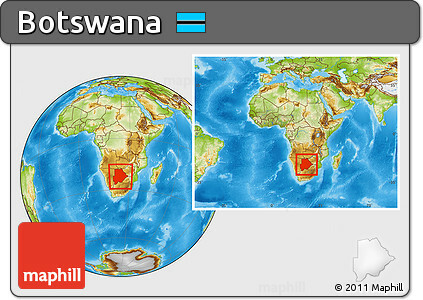 Batswana is the plural term for people who live in Botswana. The singular term is Motswana. Pula, the currency of Botswana, is also the Setswana word for rain. Botswana president Ian Khama was the son of Botswana’s first-ever president, Sir Seretse Khama. Ian Khama’s mother was an Englishwoman. Her name was Ruth Williams. Botswana is Africa’s longest surviving democracy. Capital City: Gaborone is the capital and largest city of Botswana with a population of 231,626 based on the 2011 census, about 10% of the total population of Botswana. Its agglomeration is home to 421,907 inhabitants at the 2011 census. Religion: Religion in Botswana. An estimated 70 percent of Botswana citizens identify themselves as Christians. Anglicans, Methodists, and the United Congregational Church of Southern Africa make up the majority of Christians.